FOUR PAWS vets provided care to all the lions and sterilised two male lions to prevent further inbreeding. An urgent rescue mission has been launched by vets to save five lions from an illegal zoo in the city of Razgrad, Bulgaria. International animal welfare organisation FOUR PAWS said that the big cats have been severely neglected in recent years. The cats are the result of inbreeding and are living in dreadful conditions. The zoo is owned by the city, so FOUR PAWS convinced the mayor of Razgrad to intervene. 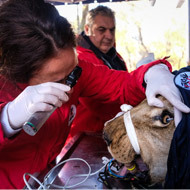 The veterinary team provided care to all the lions and sterilised two male lions to prevent further inbreeding. One lion that was considered to be in a critical condition was moved by FOUR PAWS to a nearby zoo for further treatment. The organisation aims to move most of the former zoo lions, which include two cubs, to its own sanctuaries. In the past, bred lions were sold to other zoos, circuses and private individuals. However, the introduction of stricter legislation in 2008 led to a fall in demand - hence why the lions remained in the Razgrad Zoo. Due to lack of physical exercise, FOUR PAWS says that the older lions suffer from severe spinal problems and that it is likely the cubs will too. A three-year-old lion, who was checked over in the nearby zoo, was found to have sand in his bladder and fibrosis in the kidneys. The Razgrad Zoo lost its licence in 2014, but it is still open to visitors for free. According to FOUR PAWS, the unprofessional breeding and sale of lions was used to finance the enterprise. Only one lion will remain in Razgrad until local authorities have decided whether to shut down the zoo. Until then, FOUR PAWS will keep a close eye on the wellbeing of the cats, as well as that of the other zoo inhabitants.